I could get used to this. The days may be crappy during the week but come weekend, it’s glorious and sunny (still cold though – afterall it is winter). I really have nothing to complain about since this means I could explore the city without looking like a drowned chicken. It’s really only at weekend that I usually try to venture a bit further from my normal haunts. This weekend however, I’m not exactly skipping along the cobblestones of streets unknown in the 17th or 20th arrondissement. Having the last of Christmas shoppings to complete plus a few meet ups with friends, I’m still wandering about the usual neighbourhood. The Palais de Justice was formally a palace but today a complex that includes the law courts. Sitting tight and looming large over about half of Île de la Cité, it also houses the Conciergerie and Sainte-Chapelle (which in order to visit, one would have to go through security checks that’s similar to that going to the various judiciary offices). 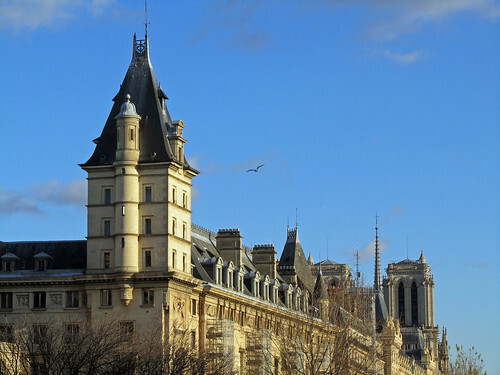 As you may have also noticed, just beyond the Palais de Justice is one of the towers of the Notre Dame Cathedral. Seriously, Paris of old makes a very compact city when you consider just how close all the important and main sites are centralised. That’s another story for another day. Later.